"Gold without freedom might as well be lead." 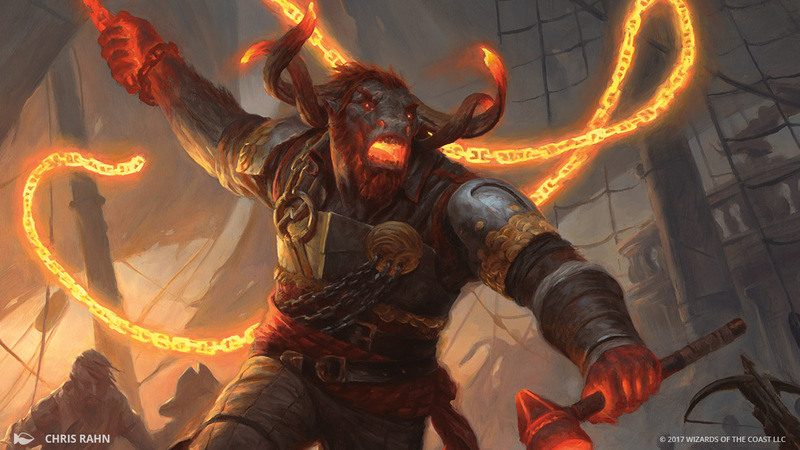 Angrath the Flame-Chained is a minotaur Planeswalker. In a cruel twist of fate, a planeswalking mishap took him to Ixalan, where of course he has been trapped ever since, unable to planeswalk away. Turned away from the Sun Empire and assaulted by the River Heralds, Angrath finally found a home among the pirates of the Brazen Coalition when Captain Radcliff of the notorious Devil's Smile offered him a place in his crew. Welcomed among the other misfits and rogues of a particularly motley crew, Angrath put his physical and magical talents to good use in Captain Radcliff 's raiding and pillaging. Soon it was clear that the rest of the crew loved and respected Angrath more than their captain, and the minotaur led a quick and almost bloodless mutiny that left Radcliff hanging by a gaff hook strapped to the bowsprit. Now-Captain Angrath changed the ship's name to Devil's Chains to reflect the magic of his searing-hot chains, and the crew's notoriety increased exponentially. Angrath is driven by a feeling of restless impatience, like a caged animal awaiting its moment of freedom. This fuels his wild temper and spurs him on in an endless series of raids upon the coastal towns of the Sun Empire. His aggression is wholeheartedly supported byhis crew. Angrath continually sets his sights on the next biggest thing—but he is never satisfied when he acquires it. In one of his recent raids, he faced off against a human warrior of the Sun Empire. As they battled, he was impressedby her skill but still utterly confident of his victory. As the killing blow approached and desperation grew in her eyes,she was suddenly engulfed in a field of glowing energy he recognized—it was the same magic that had balked him every time he had tried to planeswalk away from this infernal prison. 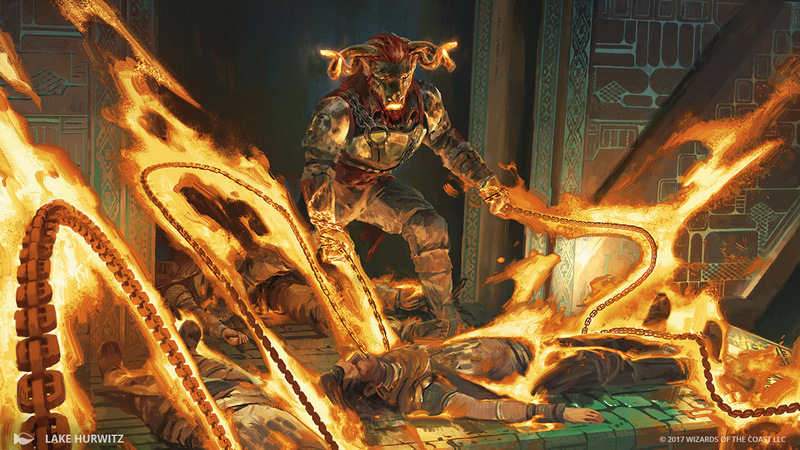 Shocked at finally meeting another Planeswalker, he spared the woman's life and retreated, for the first time he could remember. But he was sure he would see her again; their destinies must be intertwined. Eventually Angrath learned that the woman, Huatli, had gone off seeking a golden city, in pursuit of the Immortal Sun—the greatest treasure the world had ever known. This treasure, Angrath was sure, was fated to be his; why else would he be marooned on this world? The fact that the other powerful warrior was pursuing it just made it all the more desirable. The four peoples of this plane are locked in a deadly struggle as they search for the golden city of Orazca and seek to claim the magical power it holds. For Planeswalkers, though, the plane is also a prison. Huatli was raised in the Sun Empire. Thanks to her martial skill and talent as an orator, she rose to a station just short of nobility. At the moment of her greatest desperation her planeswalker spark ignited. She saw a glimpse of a faraway place, but was suddenly yanked back to where she began. The Sun Empire claimed control of Orazca, but you can still dream about what the other factions would have done with the golden city. Huatli goes on holiday, Angrath goes home, Vraska deceives a dragon, and Jace heads for Dominaria. Meanwhile, a new leader claims Orazca. Take a closer look at some of the fantastic art from Rivals of Ixalan, along with the art descriptions that led to the creation of each piece. 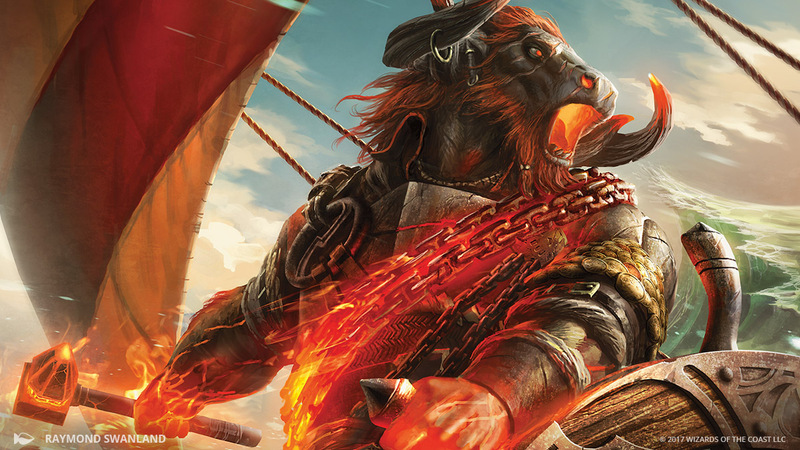 Melissa dives into the M-Files to share commentary on red, green, multicolor, and land cards during Rivals of Ixalan development.